Mangoes have been part of the human diet for over 4,000 years. The mango tree grows in the tropics and produces juicy, nutritious fruits. People eat mangoes alone or add them to fruit salads and salsas. Fresh mangoes are low in calories and contain beneficial nutrients. Available year-round, mangoes are a healthy addition to your diet. Most fruits and vegetables supply fiber to your diet. Mangoes are no different, and provide 2.6 g of dietary fiber in a 1 cup serving. Fiber helps foster proper digestion and prevent constipation. Dietary fiber has more far-reaching benefits, as well. A diet high in fiber can lessen your chances of developing heart disease, Type 2 diabetes and diverticular disease. The Institute of Medicine recommends that women consume at least 25 grams of fiber a day and men consume at least 38 grams. One cup of mango can help you reach that total. Mangoes supply a healthy dose of vitamin A. You need adequate amounts of vitamin A in your diet to support healthy eyes and proper bone growth. Mangoes supply 1,785 IU of vitamin A in a 1 cup serving. This is about 35 percent of the vitamin A your body needs daily for good health. Folate, or folic acid, is an essential B vitamin with many health benefits. Adequate dietary intake of folic acid is essential for a healthy pregnancy. Folic acid can help prevent birth defects including spina bifida and cleft palate. A folic acid deficiency can also cause miscarriage. Folic acid is used to treat megaloblastic anemia, which occurs when red blood cells are larger than normal. You need 400 mcg of folate every day, and 1 cup of fresh mango supplies 71 mcg. A 1-cup serving of fresh mango supplies other nutrients as well. One of the most notable is vitamin C, with 60 mg per serving. Adult women need about 75 mg of vitamin C a day and men need about 90 mg. Mangoes are high in potassium, and one serving has 277 mg. Mango also contains small amounts of calcium, iron, magnesium and phosphorus. 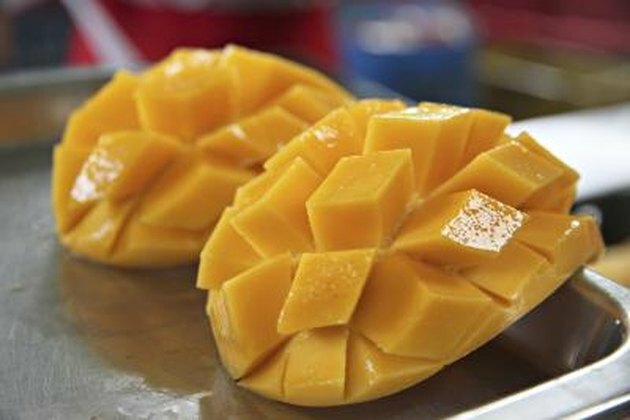 One cup of mango also provides trace amounts of copper, selenium, manganese and zinc. Adding mango to your diet can help you increase your intake of all these important nutrients.